Rare and nice Road & Tunnel Slag. Made by Chris Robinson, circa 1993-94. I like his woody striped transparent submarine, which I seen a while back. I had been watching it for days now. I real wanted it, but I know the high bidder would enjoy it much more than I. The seller has me thinking... 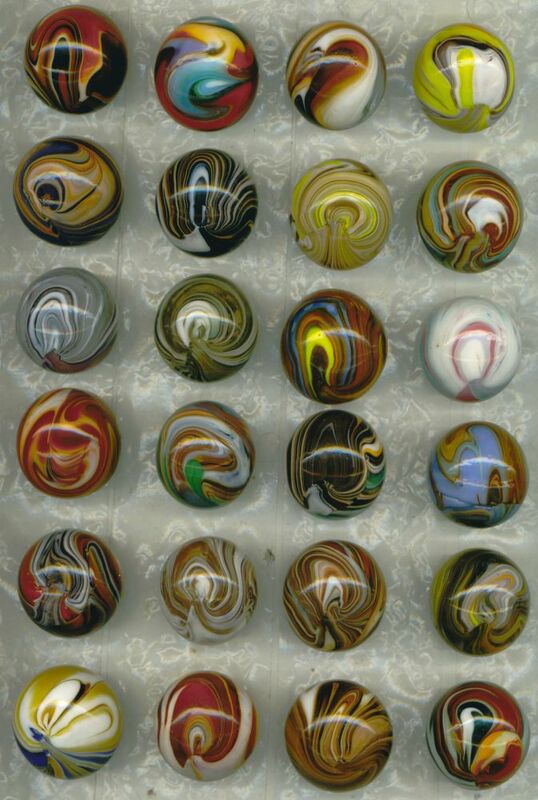 It's Lee's Legendary marbles, but the user Id make me think about Leroy and his love for cat'seye marbles. Someone help me with how this is "rare"? Chris Robinson can fire-up the torch and crank out as many as you want. How often do you see Robinson Road & Tunnel Marbles offered on Ebay? 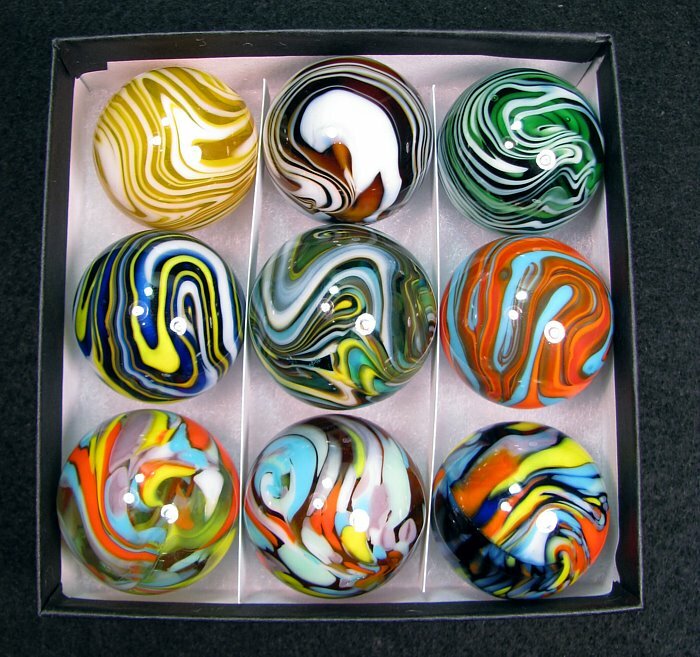 How often do you see these for sale at marble shows? By this definition alone, the appearance of a R&T for sale is a "rare" event. 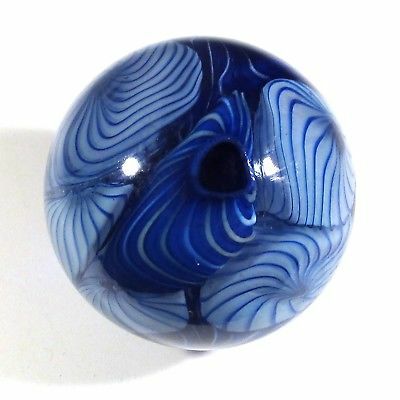 This is an uncommon marble. Very few of the Road & Tunnels were made with enough "roundness" that Chris thought they were sellable. So, a "round" R&T unto itself is rare. Not all sold R&T marbles have such a well defined road and tunnel graphic. 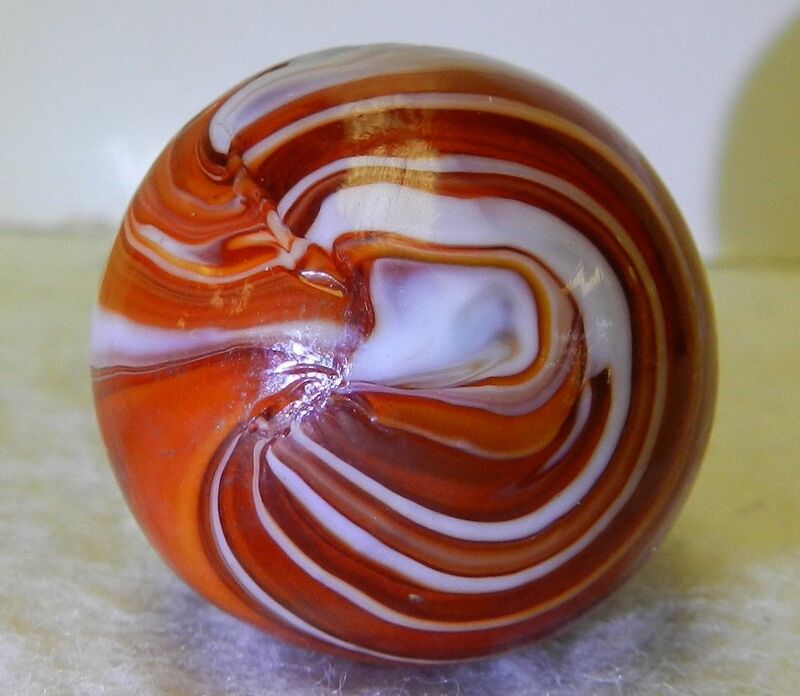 This exact marble is of unusual roundness, distinctive pattern with an eye appealing color combination. This is a distictive marble. The suggestion that Chris can fire-up the torch and crank out as many as you want, is a false premise to invalidate the usage of "rare". My statement is in the present tense. Even if Chris fires-up the torch and cranks out as many as you want, my statement holds true as when written. 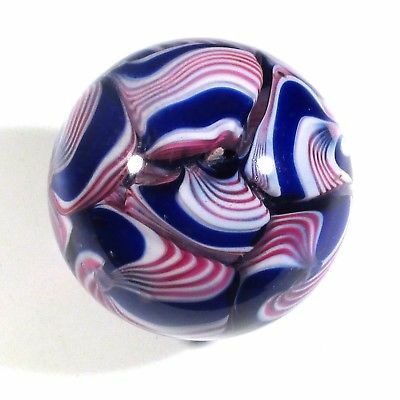 In the universe of marbles (data set), what percentage do you think existing Chris Robinson Road & Tunnel marbles total? Chris did not keep detailed records. After talking with him, there are probably fewer than 100 in circulation. If Chris did resume production, what number would he need to produce for his R&T Marbles not to be "rare"? Using better logic, please articulate why you think it is not "rare"? Are you sure this is one of the original road and tunnel slags? I've seen a couple modern red slags in this size at shows. Not many, but they are out there. I don't recall the same nice pattern. I also thought the road and tunnel slags were made partially by machine. Pretty sure it is one of Chris' original runs. It was made with Fenton transparent red and Hobnail white (Gabbert Cullet). Under hard lighting the deep red goes orange (auction photos 1-6). I guess that is why the seller posted photos under two lighting conditions. The second set of photos (7-12) show the deeper red. Just two colors and some "gravitational" twisting makes a wonderful pattern! Notice the "U" or "V" shaped cutline? That is from using diamond shears. The shears sucked out too much heat at the cutline, thus inhibiting it from completely melding into the body. Also, if you look close enough, the "sphere" is quite "lumpy". This was because the roller geometry wasn't optimal on his machine. Yes, R&T marbles are machine rounded. I took possession of Chris' machine from John Hamon-Miller at Amana, 2004. Rebuilt and returned it to Chris in 2005. 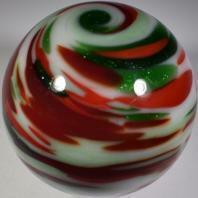 He did attempt to make marbles on it, but was frustrated again by its inability to consistently produce round marbles. I too have seen R&T Slags at shows and I have bought them (if the price was right). There aren't that many in the wild. Chris' are very distinctive from other large slags. Once you develop an eye, you can pick them right out. Here are some large Shamrock slags (1-1/4" - 1-3/8" diameter) for reference. [Box set made by Craig aka "spara50"]. Totally different pattern than Chris'. Also, my cut lines are straight. Those are stunning , absolute master pieces. More added to my WANT list! EXCELLENT video John.... Thanks for that link! Thank you for that exhaustive word definition research - and for taking the time to quote direction from the Merriam Webster dictionary. Not to mention the analysis and statistical work that went into it. Sorry that I touched whatever raw nerve is embedded in there somewhere that spawned such a Wall-of_Text response. Magnificent and Beautiful glass work... by both Chris and John! You are most welcome. I presumed you were busy and didn't have time to research it yourself. After all, you did ask for help understanding why I used the adjective "rare". No raw or "rare" nerve here. It appears my usage of the word got you going first. However, I do like the way you try to twist who has the raw nerve. As far as being verbose, I do not apologize. I try to be clear. What I see on marble boards is the more an individual knows the shorter their post. This brevity, or economy, of words can come off as curt and uninviting for continued discussion. New (and old) people need slack and the chance to err. It is the job of experienced people to kindly spread any tribal knowledge. Again, it is all good here in Kansas. Thanks for the generous compliments. Each marble has the distinctive DNA of the original artist and are signed by that artist. The miniature Matthews signature is a marvel unto itself. Those on Mark's website are from last year, 2016. Mark has some completely different marbles from this year's run, 2017. Mark dug way back into his archives. My favorites are his clam broth and peppermint reruns. Also, Hot House Glass has a grouping for sale. They sold their first listings (BIN) very quickly, but are going to do a second release soon. They anounce their Ebay listings via their FB account. Their construction and use of dichro make their marbles pop! John I saw the FB post and video of the event. Looks like everyone had a great time. The mibs were gone by the time I hit eBay. Really cool stuff. Will try again if I see the post sooner this time. PS. All this time I thought 'rare' was just the way I cooked my steaks. Learn something new everyday on these here marble forums. It wound up with me and being a reproduction, or whatever terminology you would like to use, would explain why I thought the colors used were so strange in hand. Not much transparency in it to pin down a color either but I will go with "red".